Interstate 470 travels south from I-70 near St. Clairsville, Ohio to the Elm Grove community in east Wheeling, West Virginia. The freeway takes a more linear path as compared to the older urban route along Interstate 70 to the north. 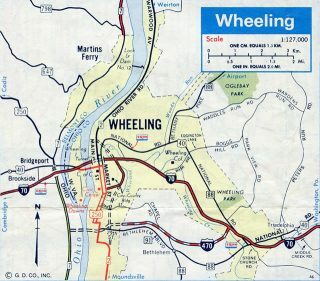 It also provides the main trucking route across the area, as I-70 passes through the Wheeling Tunnel near Downtown, Wheeling. 2015 traffic counts peak at 44,456 vehicles per day (vpd) on I-470 across the Ohio River bridge. A comparable amount takes I-70 through Wheeling, with 46,626 vpd recorded by WVDOT in 2014. Within Ohio, ODOT recorded 30,810 vpd along I-470 to the north of Bellaire in 2012, while I-70 topped out at 27,540 vpd at a location just east of the split with Interstate 470. 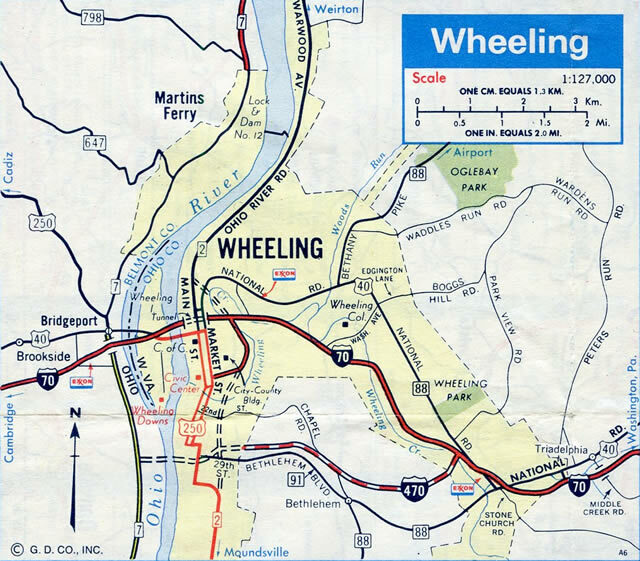 Wheeling Chamber of Commerce map, circa 1976, showing the projected path of Interstate 470 to the south. Initial construction for Interstate 470 focused on the freeway west from Elm Ridge to Bethlehem, West Virginia. 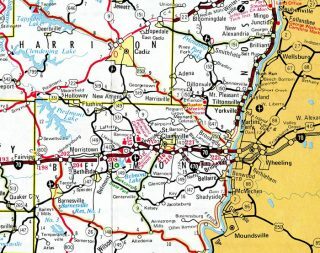 Interstate 470 under construction on the 1982 Official Ohio Highway Map. 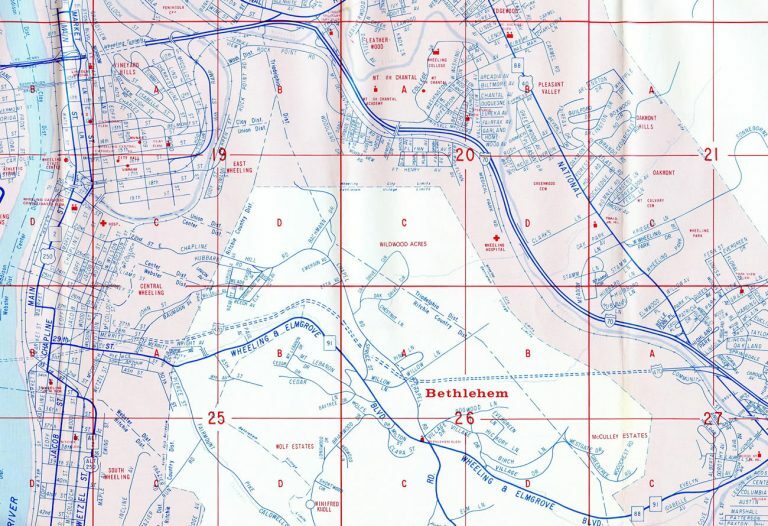 The 1983 edition showed the route complete. Winding southwest by Tridelphia, drivers along I-70 west passed by a button copy sign on the two mile approach to Exit 5A with Interstate 470. A full sign bridge replaced this ground level assembly by 2015. Photo taken by Ian Ligget (05/12/11). Also replaced by 2015 was this diagrammatic sign for the upcoming wye interchange (Exit 5A) with I-470 west. The westbound freeway enters the Wheeling city limits in the next half mile. Photo taken by Ian Ligget (05/12/11). Interstate 70 west reached the folded diamond interchange (Exit 5) with U.S. 50 and WV 88 a half mile ahead of the left exit for I-470. This sign bridge at Elm Grove in Wheeling was removed by 2015. Photo taken by Ian Ligget (05/12/11). Interstate 70 angles northwest from Elm Grove to parallel Wheeling Creek into Wheeling. The area topography sees I-470 depart from the left onto a long viaduct spanning U.S. 40, Wheeling Creek and Wheeling Heritage Trail. I-470 bypasses the city center to the south through the village of Bethlehem. Photo taken by Ian Ligget (05/12/11). I-70 continues northwest with two lanes to the Wheeling Tunnel. A lane drop for WV 2 reduces traffic to a single lane across the Ft. Henry Bridge into Ohio. I-470 meanwhile maintains two westbound through lanes, but with a steep grade descending into the Ohio River valley. Photo taken by Ian Ligget (05/12/11). Interstate 470 east merges onto I-70 east ahead of the loop ramp (Exit 5) for U.S. 40 at Elm Grove in Wheeling. The freeway lowers past the J.B. Chambers I-470 baseball and softball Complex to span Wheeling Creek and U.S. 40 at the wye interchange with Interstate 70. This set of signs was replaced by 2007. Photo taken 10/15/04. The initial sign for the I-70 and I-470 split appears at the Mall Road off-ramp (Exit 218) for Ohio Valley Mall just outside the city of St. Clairsville. Photo taken by Ian Ligget (05/14/11). Button copy sign posted at the Banfield Road overpass for Interstate 470 east (Exit 219). 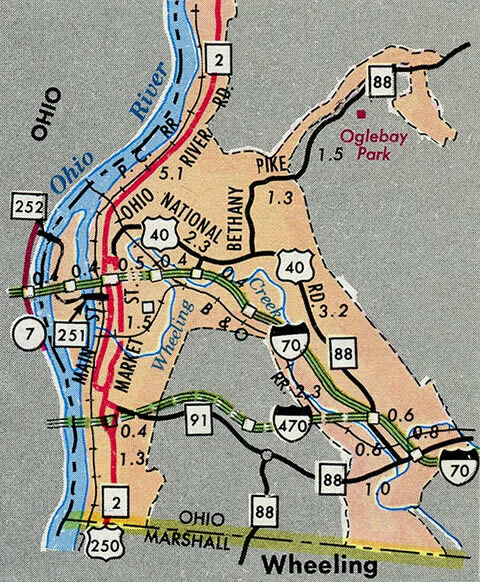 I-470 connects with Ohio 7 at the Ohio River and northern reaches of the Bellaire village limits. 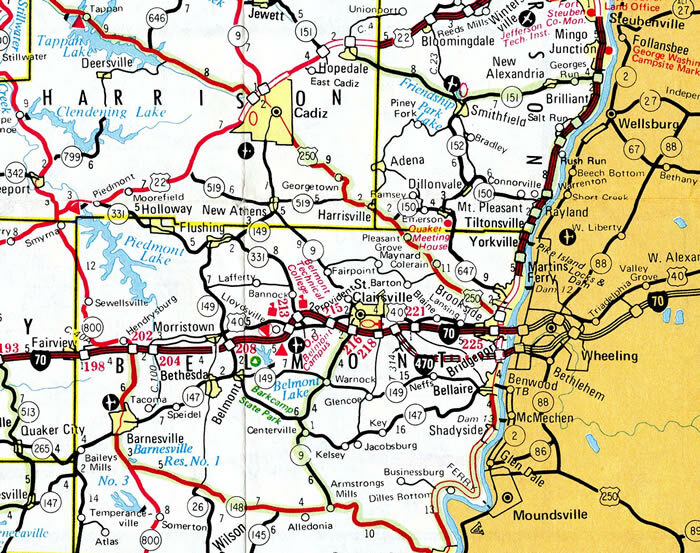 Washington, Pennsylvania is where I-70 east merges with Interstate 79 in 38 miles. Photo taken by Ian Ligget (05/14/11). Interstate 70 continues east with three lanes from Mall Road to the wye interchange (Exit 219) with Interstate 470 east. Photo taken by Ian Ligget (05/14/11). Two lanes of traffic part ways with Interstate 70 east for I-470 at Exit 219. 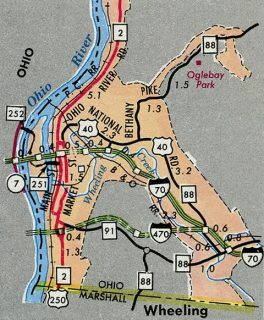 The Wheeling bypass elevates onto High Ridge to the Ohio River while I-70 parallels both U.S. 40 (National Road) and Wheeling Creek to Bridgeport. Photo taken by Ian Ligget (05/14/11). Interstate 470 merges onto I-70 west just ahead of St. Clairsville. The west end splits with a two-lane ramp onto Interstate 70 west and a long off-ramp to Banfield Road. The Banfield Road half diamond interchange (Exit 1) was originally accessible from the I-70 mainline, but now motorists headed to Ohio Valley Mall must continue west to Exit 218 (Mall Road). This set of button copy signs was replaced by 2008. Photo taken 10/15/04. “back to the road future Interstate system paved way for progress, travel in W.Va.” Charleston Daily Mail, May 29, 2006. Wheeling I-470 Ohio River Bridge. Structurae. “Two-state handshake.” Akron Beach Journal (OH), November 19, 1983. “Interstate Reopens After Crews Fill Old Mines Under Roadway.” Plain Dealer, The (Cleveland, OH), December 22, 1996. Page updated February 2, 2017.